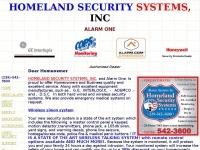 Homeland Security Systems has Cape Coral Florida home security systems, business alarms and best local security companies in SWFL. The main topic of the website is Home Security Companies - http://www.cfalarms.net/. The web server used by Cfalarms.net is run by OLM, LLC and is located in Trumbull, USA. On this web server 58 other websites are hosted. The language of those websites is mostly english. A Nginx server hosts the websites of Cfalarms.net. The website does not specify details about the inclusion of its content in search engines. For this reason the content will be included by search engines.